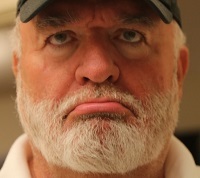 Bill is not a happy camper -- Life's Hell in Lawless America - $100,000 Hell Today. Bill Windsor's car was broken into, and he has been informed that auto insurance does not cover the contents of his vehicle. As he had to give up his apartment while in jail, his homeowner's insurance was canceled as he had no home. $100,000 is the estimated loss. Devastating! At 4:15 pm on January 15, 2016, the glass is being replaced in the two right windows. The glass man explained that the front windows on the SUV is laminated gas that is not easy to break into. So, the next time you buy a car, get one where the alarm goes off even with just broken glass, and get laminated glass that doesn't shatter into hundreds of pieces. The vehicle was broken into 10 minutes after Bill Windsor parked and took groceries and his dinner into a hotel on January 14, 2016. 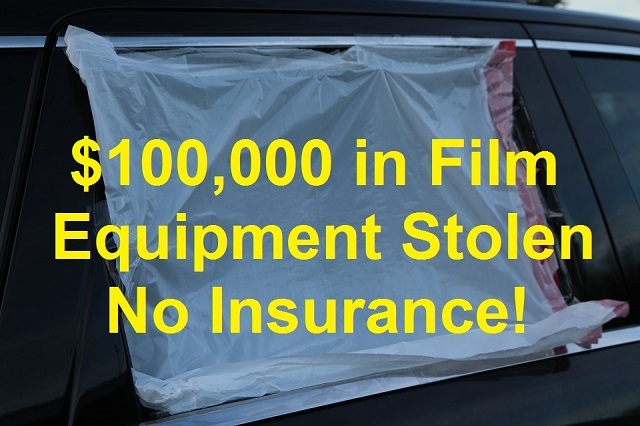 ALL movie equipment was stolen as well as everything filmed for the last 15 months. The break-in took place at 9:20 pm. Police have been here as has CSI. Detectives are supposed to contact me. I finished moving everything that was left from the vehicle into my room at 1:45 am. The timing and the stolen items are awfully suspicious. And there was a lot of other stuff in the jam-packed vehicle. They didn't take the laptop -- just the motion picture cameras and gear. They broke the window right where the motion picture camera case could be pulled out through the window. It appears they then grabbed whatever else they could reach that had gear in it. The car was parked at 9:10 pm -- only 10 minutes before the break-in. There were no other cars broken into -- just mine. Mine was directly under the brightest double street lamp I could fine; that's where I always park to deter break-ins. One of the hotel guests saw the end of the break-in and gave a description to the police. I saw a fancy white pickup truck earlier today that I thought might have been watching me. He sat outside my hotel in Amarillo with the motor running. He was there when I took a load out to the car. He was there when I took another load out to the car. He was there after I returned the luggage cart and checked out. Just sitting. Then when I pulled out, he pulled out behind me. I started to write down his license number, but I blew it off. I had planned to rent a storage unit and put everything in it on arrival. It got dark, and I decided to wait until morning. At 10:43 pm, the police left. CSI arrived at 12:15 am to dust for fingerprints and swab for DNA. A detective will contact me in the morning. The CSI lady noted that the thieves also tried to break into the right front window to get the laptop and a camera on the floorboards. My Canon 5D camera bag with all my lenses was taken. One large red canvas bag filled with assorted film equipment was taken. My fancy tripod was stolen. My laptop was still in the case tucked up under the dashboard. My everyday companion, my Canon EOS 5D Mark II camera with a telephoto lens, was taken. Several boxes or bags that were next to the motion picture rolling case were taken. Thank the Lord I gave all the movie film to someone for safekeeping to take out of Montana!!! 365 days of filming is safe and sound with a trusted friend. I arrived at the hotel at 9:10 pm, brought my groceries in from the car, and started eating the dinner that I picked up at the supermarket. The break-in was just 10 minutes after I parked. I was going back out to bring in another load after I finished dinner. The hotel does have video. The thieves kept the lights off on their car, however. I had noticed some people looking at me and the car when I unloaded my luggage earlier. The CSI Lady told Security Guard Laniqua and me that there are videos on YouTube showing people just exactly how to easily break into cars. You are here: Home News William M. Windsor Criminal Case News Bill Windsor's car has been broken into - All Motion Picture Equipment Stolen.